The Lone Star State is home to over 840,000 ponds and lakes called stock tanks. These muddy, artificial reservoirs are often created by bulldozing pits or dams across gulleys in order to catch surface runoff. 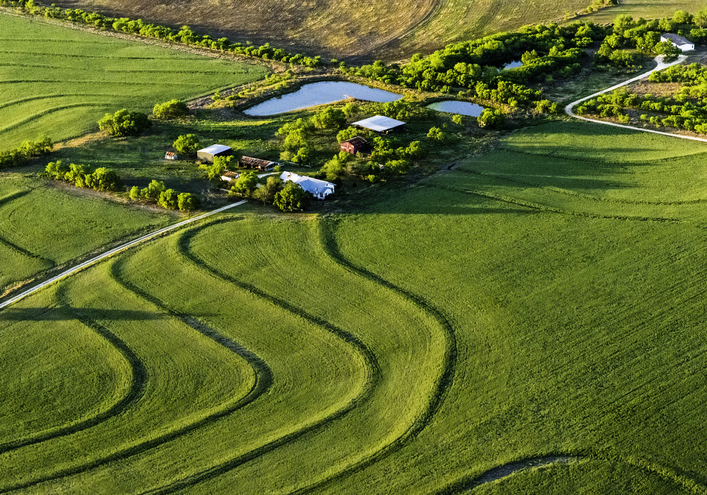 On average, stock tanks in Texas cover about four-tenths of an acre. But size varies – in South Texas, for instance, a tank can be as large as 25 acres, while in East Texas, tanks tend to be smaller. Stock tanks keep cattle alive in the semi-arid landscape of Texas, particularly during times of drought. A cow that weighs a thousand pounds, for instance, can drink as much as 15 gallons of water each day. During the drought of 1885-86, ranchers lost tens of thousands of cattle and were forced to sell off the rest of their livestock at a loss. Strategically placed tanks also encourage livestock to graze evenly across the pasture, which helps slow down erosion caused by chronic overgrazing. This is because heavy, high-grade cows don’t stray farther than a mile from their water source. A study by the Texas Real Estate Center found that ponds increase value by as much as $4,500 for each of their surface acres. According to the US Soil Conservation Services (SCS), roughly 80 percent of stock tanks in Texas contain fish, usually bass or channel cat. Even unstocked tanks contain fish that either swam upstream during a flood or got caught as eggs on the long legs of herons that wade through shallow waters. Although tanks primarily serve the business side of farm production, they also add aesthetic value to farms and ranches. Nature lovers appreciate the scenic beauty of these reservoirs that add character to an otherwise dry and dusty landscape. Before stock tanks rose to popularity, herders nudged cattle along from seasonal creeks to perennial springs in an attempt to mimic movements of bison across the Great Plains. The use of barbed wire and fencing confined livestock to waterless areas. In order to provide for their livestock, ranchers dug pits and dammed arroyos to catch and hold rainwater. Carrying dirt-filled rawhide bags out of craters and emptying them onto dams proved to be difficult work. Ranchers also resorted to using various techniques in order to strengthen their tanks. One technique involved slaughtering heifers and mixing their blood with the soil, while another entailed throwing salt into empty tanks so that cattle would lick it, trampling the ground in the process. When building a tank, ranchers must take important factors like location, reliable water supply, and design criteria into careful consideration. When looking for a water source, keep in mind that some surface water is state-owned, and ranchers need to secure a permit from the Texas Commission on Environmental Quality before they can start filling their tanks from this source. Surface water that flows from a watercourse on the land is also considered state property. If the water that fills your tank is diverted from a watercourse, you are essentially taking state-owned water. A permit isn’t needed when using privately-owned surface water. Groundwater is usually privately owned. However, if you intend to fill your tank from a well, you might need to get a permit from the local groundwater conservation district. If you’re looking for South Texas ranch property in Live Oak, Duval, McMullen, or Jim Wells Counties, Desert Flower Realty would be happy to assist you. Call me, John Walker, at 361-449-2051 or send an email to DesertFlowerRealty(at)DesertFlowerRealty(dotted)com. As a South Texas native with over 30 years of ranching experience, I will put my knowledge and experience to work for you!